William Green was born in South Carolina around 1803 and moved some time in his young life to Bulloch County Georgia. He appears to have married Polly Turner in Bulloch County on March 30, 1829. Polly was the daughter of Charles Turner. Around 1835, the family moved to Tattnall County Georgia and settled in the Pinegrove Church area between the towns of Collins and Cobbtown. William Green had a total of eight children, three sons and five daughters. All three sons enlisted in the Confederate Army. The oldest son John Green was born in Bulloch County Georgia in 1830. He was married on November 24, 1853 in Tattnall County to Elizabeth Rogers daughter of John Rogers. They had five children all daughters. John enlisted as a Private in Company G, 47th Georgia Volunteer Infantry (The Tattnall Invincibles) part of the Army of Tennessee on September 1, 1862. John served in this company until he contracted pneumonia early in 1864. He was sent to Newsome Hospital at Cassville Georgia. John died at Newsome Hospital in Cassville Georgia of pneumonia on March 10, 1864. In a Cassville Newspaper, John is listed among the dead at the Cassville Hospitals. John’s burial location is unknown. If he is buried in the Cassville Cemetery his grave is not marked. There are several unknown confederate graves in the Cassville Cemetery but according to the Newspaper, John’s identity was known when he died so it is unlikely that he is buried in one of the unknown soldier’s graves. His wife Elizabeth is buried at Old Anderson Church Cemetery in Tattnall County but John is not buried there. undertaker. 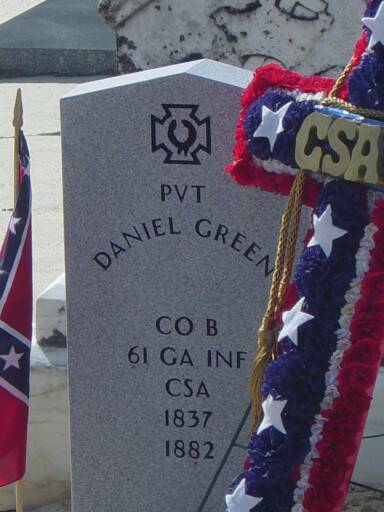 In the Confederate section, T. Green is buried in Grave 10, Line 5, Lot 79. His coffin or body measured 6'-5" long and 20" wide. 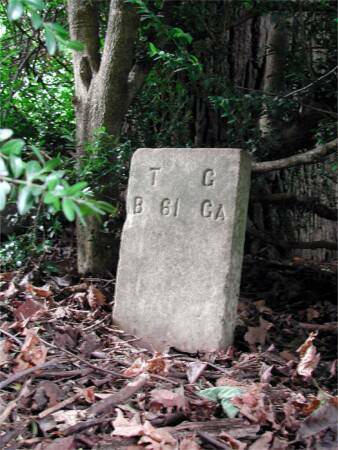 Below is a picture of his grave - courtesy of Vance. C. Harris.